Looking for things to do in Sandwich? It’s another great destination for an easy trip out from Yorke Lodge Bed and Breakfast. The town of Sandwich, Kent is easily accessible from Yorke Lodge. By car it takes approximately 30 minutes via the A257. There is limited parking available in Sandwich. Car parks are at The Quay, CT13 9EN. The Guildhall CT13 9AP and Gazen Salts, CT13 9EU. Charges may apply. Or you can take the hourly train from Canterbury West. The journey takes about 50 minutes including one change at Ramsgate. Canterbury West Station is an 11 minute walk from Yorke Lodge. Sandwich Station is at the southern end of the town of Sandwich. So where is Sandwich exactly? Well the historic town of Sandwich is in East Kent. The first written mention of Sandwich is from around 664 AD. However, it is probable that the Romans settled here. Sandwich is not far from Richborough where an army of 40,000 Romans landed in 43 AD. They occupied a vast area at Richborough. They built Richborough Fort and established Richborough as the “Gateway to Britain”. Richborough Fort is now called Richborough Castle. Sandwich was one of the original Cinque Ports. These also included Romney, Dover, Hythe and Hastings. Edward the Confessor initiated the idea of a group of ports to protect England from the French. They had to provide ships and men to the crown. In return they were granted a highly prized charter of privileges. These included not having to pay tolls and duties. They were also allowed their own judicial courts. The Cinque Ports evolved over the centuries to reach their most powerful status in the Middle Ages. The port was called Sandwich Haven. It was situated on the Wantsum Channel. And was once the fourth most important port in England. Making it extremely prosperous. The town of Sandwich is now, however, two miles from the sea. The Wantsum Channel was a major shipping route. It cut off the Isle of Thanet from the rest of Kent. But over time the channel silted up. This increasingly restricted access to Sandwich Haven. In addition medieval monks wanted land for farming. So they drained the salt marshes next to the Wantsum Channel. By the end of the 16th Century, however, Sandwich was no longer a prosperous port. Thanks to both natural and man made causes. The Great Storm of 1287 didn’t help matters. Rivers became blocked and towns were literally drowned. But from the 11th to 13th Centuries the port and town of Sandwich were hugely significant for England. Not only was Sandwich a major gateway for exports and imports. It was also where monarchs set sail for the continent. Whether for royal progresses abroad or for wars. It was from Sandwich that Henry V embarked with his army of archers in 1415. They were on their way to Agincourt. No one asked “Where is Sandwich?” Everyone knew, even the French! Thus the easy access that worked in Sandwich’s favour also worked against it! Sandwich was raided by the French on several occasions. Including an attack in 1457 by 4,000 Normans. That is Frenchmen, mostly from Honfleur on the Normandy coast. They weren’t all called Norman! Happily Sandwich and Honfleur are now twinned! What is striking about Sandwich today is its history. And not just its written history. History is visible wherever you go. Quite simply it is an extraordinary example of a medieval town. But it is a living, breathing, working medieval town existing in the 21st Century. It was the first British town to have a preservation order placed on it in its entirety. It also has more listed buildings per head of population than anywhere else in Britain. As you would expect from a medieval town, the streets are narrow. It is also quite small. Thus really the only way to see it is to walk. But keep your eyes peeled! There is much to see in every street and around every corner. Sandwich was a walled town and parts of the town wall are still in evidence. Guided tours by the Sandwich Local History Society can be booked in advance. See www.sandwichlocalhistorysociety.org.uk. Or if you just want to meander round the town you can download the Town Trail leaflet from www.open-sandwich.co.uk. Where you can also find a link to the comprehensive Royal Geographical Society Sandwich Walk guide. Both these sites are also excellent sources for further information about Sandwich. They have links to all the things to do in Sandwich listed below. For even more information and links www.sandwichtowncouncil.gov.uk has all the relevant facts. How you arrive, by rail or road, may determine how you wish to see Sandwich. But to get the most out of your visit to do a bit of homework first! Check out the websites mentioned above to get a feel for Sandwich. And for its layout and what it has to offer print off one of the handy maps. Even if you’ve pre-booked a guided tour! There is a Visitor Information Centre at the Guildhall in the centre of Sandwich. This is open from April to November. The Guildhall, CT13 9AH – Tel: 01304 613565. There follows a list of things to do in Sandwich. This is not exhaustive. But all the places mentioned will be part of a town trail or tour in the town of Sandwich. And there will still be some things to do in Sandwich for you to discover yourself! There are also a few other things to do in the area of Sandwich, Kent. Only some postcodes are included. Most of the things to do in Sandwich are reached by walking. Strand Street is the oldest street in Sandwich. Several of Sandwich’s many listed buildings are located here. In fact you’re unlikely to find another street in England with as many half-timbered houses. Manwood Court, Strand Street, Sandwich, Kent was built as a school in 1563. It occupies the site of the Great House. Records from the 13th Century show that this was a hospice owned by monks. Pilgrims visiting Canterbury probably stayed here. The school moved to Manwood Road in 1895 and is still there. Manwood Court is now private residences. Harfleet House, Strand Street, Sandwich, Kent is noted for its enormous cellars. These date from Norman times. Barrels of wine would be stored here. As well as a multitude of goods from trading ships. They also have Sandwich’s only known fireplace to be built in a cellar. This has led to speculation that it may have been the site of Sandwich Mint. The British Museum has a collection of coins going back to the Normans. These bear the stamp SANDWI (an ancient name for Sandwich). Kings Lodgings, Strand Street, Sandwich, Kent This is a timber framed building dating from the early 1400s. The Kings Lodgings was originally owned by Christchurch in Canterbury. It is thus believed that this was the principal guesthouse for pilgrims. There is a date stone of 1713 on the front of the building. This shows that the facade was a much later addition. In the meantime the main doorway had been added in 1534. This was to honour Henry VIII when he stayed there. It is also thought that Queen Elizabeth I visited the house in 1573. St Mary’s Church, Sandwich, Kent is technically on Church Street St Mary’s. But when walking down Strand Street you can’t miss it! It is thought to be on the site of a Saxon convent. But as a church probably dates from the 11th Century. During French raids in 1217 and 1457 the church was severely damaged. So it has been rebuilt several times! An earthquake in 1580 shook St Mary’s causing long term damage to the tower. This eventually collapsed in 1667 leaving the church without a tower. The Weavers, Strand Street, Sandwich, Kent Like several of the houses in Strand Street the upper storey of The Weavers juts out. This was to make the best use of limited space. The Weavers got its name from Dutch migrants who settled here in the 16th Century. However, the building significantly predates this. During the height of Sandwich’s prosperity it was the Bull Inn. As such it was a meeting place for tradesmen, townspeople and sailors. It would have been possible to see the Wantsum Channel from here. The Dutch House, King Street, Sandwich, Kent Although not on Strand Street, this is included here for historical and architectural purposes. As mentioned above Dutch migrants settled in the town of Sandwich in the 16th Century. Between 1560 and 1640 Spanish oppression forced thousands to flee Holland. Many prospered in Sandwich. While some lived in existing houses others built homes in their own style. The Dutch House is probably the best example in the town of Sandwich. Old Jail, St Peter’s Street, Sandwich, Kent This used to be called Jail Street. The Medieval jail can still be seen. St Peter’s Church, St Peter’s Street, Sandwich, Kent Whilst still consecrated the only service held here is on Christmas Eve. In the heart of Sandwich it is also at the heart of the community. Exhibitions are held here throughout the year. As well as other local events. St Peter’s is believed to have been destroyed by the French in 1216. It was later rebuilt by Norman monks. The tower collapsed in 1661. It was repaired by Dutch refugees, some of it in the Dutch style. The Curfew Bell is rung from the tower at 8pm every night. It was a medieval practice alerting people to go inside. And for them to let their animals out onto the streets! 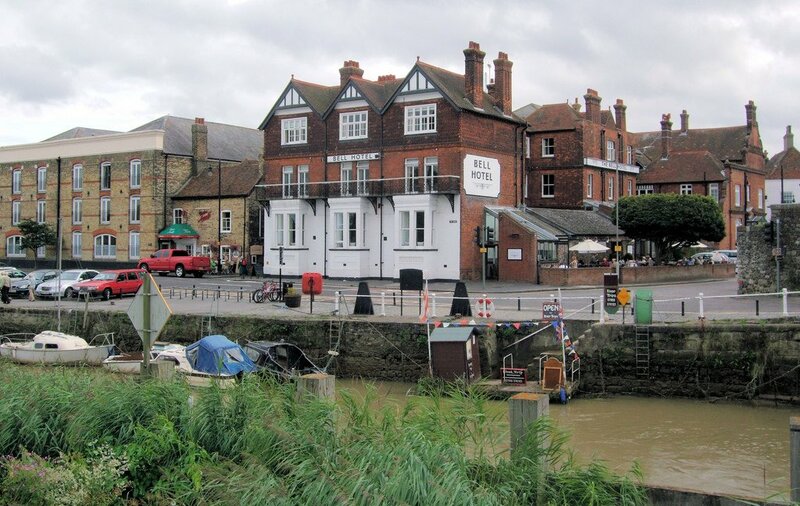 The Quay, Sandwich, Kent is now on the River Stour. But was originally on the Wantsum Channel. It was therefore the site of the major port of Sandwich Haven. Goods being shipped to and from the continent were loaded and unloaded. While kings and armies embarked for war from here. The Quay was refurbished in 2014. There are now bistros, bars and pubs where warehouses once stood. The Barbican and Toll Bridge, Sandwich, Kent The Barbican was built in the 14th Century to collect tolls. It was one of the main gatehouses into the town of Sandwich. It formed part of the town’s fortifications. It is one of only two gatehouses still standing. From 1759 until 1977 a toll was charged to use the bridge. While there is no longer a toll there are still traffic restrictions. The Fisher Gate, Sandwich Kent This is the other remaining gatehouse into the town of Sandwich. It was the main gateway through which merchants walked to do business on the Quay. Like the Barbican Fisher Gate was fortified and dates back to the 14th Century. However, what we see today dates from 1581 when it was modified. St Clement’s Church, Church Street St Clement’s, Sandwich, Kent Of the three churches in the town of Sandwich this is now the parish church. It dates back to the 12th Century. It doesn’t seem to have suffered from French raids, earthquakes or collapsing towers! In fact the Norman tower was once a navigational aid for ships. It was also used as a lookout point for enemy activity. And it was where Town Mayors were elected by common consent until 1685. If once elected the mayor refused to serve, then his house would be demolished! United Reformed Church, Cattle Market, Sandwich, Kent This is one of the earliest independent churches. It was built in 1706. It cost almost £400 to build. It was then modified in the mid 19th Century. The Guildhall, Cattle Market, Sandwich, Kent Built in 1579 this is a remarkable building. There is a brand new museum attached to it with superb artefacts. Among these is the Sandwich Magna Carta of 1300. Also fragments of a charter issued by Edward I confirming the town of Sandwich as a Cinque Port. The people in the museum couldn’t be more helpful and welcoming. Right next to the very new is the very old. The Guildhall Courtroom is steeped in history. It has oak paneling, original candlesticks and even a fold-away jury box. Until relatively recently it was still in use as a court room. Nowadays, however, it is used as a wedding venue. It is also where the annual and ancient ceremony for collecting ship money is held. This takes place in July. The Sandwich Shop, Sandwich, Kent Of course no article about Sandwich would be complete without mentioning the sandwich! Its invention is widely attributed to the 4th Earl of Sandwich in 1762. The Earl was unwilling to leave the gambling table to dine. So he ordered his meat to be brought between two slices of bread. It is believed that such a snack already existed. However, the story goes that the sandwich became the sandwich when others requested “the same as Sandwich”! The Sandwich Shop gets a special mention because it’s a clever name! As well as sandwiches and delicious cakes it also sells Sandwich souvenirs. There are many other sandwich shops, coffee shops and eateries in Sandwich. The Butts, Sandwich, Kent is on the westernmost part of the town of Sandwich. It turns down to the left from the top of Strand Street. The Butts was where the town’s archers had to practice. It is therefore highly probable that Henry V’s archers practiced here before embarking for Agincourt. The area is now a recreation ground. There is also a cricket pitch and pavilion. The Rope Walk, Sandwich, Kent is a continuation of the Butts. It heads eastwards in a straight line. It is so called because it was used for making ship rope. The process required a long, straight path for “walking out”. It is also evidence of Sandwich’s maritime history. Mill Wall, Sandwich, Kent is part of the old town wall. A windmill used to stand here, hence the name. Mill Wall leads back towards the Quay. Thus completing a circular walk around the town of Sandwich. Pubs in Sandwich, Kent There were once more than 20 pubs in Sandwich. There are now about half this number. Many date back to the 17th Century and beyond. The King’s Arms in Strand Street is still there. It was established in 1592. It briefly became the Queen’s Arms in 1573. This was in honour of the first Queen Elizabeth’s visit to the town of Sandwich. By contrast the Crispin, also in Strand Street, has only been a pub since 1824! However, it was active as an inn in the Middle Ages. Shoemakers and leather workers used to meet here. St Crispin was their patron saint. The Bell is on the High Street and opposite the Barbican. It dates from 1648. Charles II drank a “glass of sack” here. He was on his way to greet Queen Henrietta Maria in Dover. She was returning from exile. This is just a flavour of Sandwich’s pubs. There are many more just waiting to be explored! These include several annual festivals. The Sandwich Celebration is a food festival in May. Le Weekend, a French festival, takes place in June. As does the Sandwich Medieval Fayre. The Sandwich Folk Festival is in July. The climax comes with the Sandwich Festival over the August Bank Holiday. The Secret Gardens at the Salutation, Sandwich, Kent CT13 9EW The Salutation is a Grade I listed house. It is now a hotel. The gardens are a designated historic park and garden. They were designed by Lutyens and Jekyll. And are perhaps the “finest example” of all their historic garden designs in the UK. The Secret Gardens are open all year round from 10am. And there is a gift shop and tearoom. But shh, don’t tell anyone! For more information go to www.the-salutation.com then click on gardens. Golf in Sandwich, Kent There are no less than three championship golf courses in Sandwich. The most famous is probably Royal St George’s. This opened in 1887 and has hosted the Open Championship on 15 occasions. Prince’s and Royal Cinque Ports complete the trio. For details of these and other golf clubs in the Sandwich area go to www.sandwichgolf.co.uk. Sandwich & Pegwell Bay Nature Reserve CT12 5JB Not long after the Romans had left the Vikings arrived! They came ashore at Pegwell Bay. There is a replica Viking ship here. A great place for a family day out! Wildlife and wild flowers abound and history is ever present. For more information click on www.kentwildlifetrust.org.uk then search Sandwich & Pegwell Bay Nature Reserve. Sandwich Bay Bird Observatory Trust, CT13 9PF This is an accredited bird observatory and a registered charity. There is a modern Field Centre offering talks and workshops. As well as education, training and research. The SBBOT is committed to conserving the natural environment around Sandwich Bay. Birds, butterflies and dragonflies abound. Perfect for birdwatching and walking. Full details of the Trust and events for members and non-members alike can be found at www.sbbot.org.uk. So, as you can see, there are plenty of things to do in Sandwich. Enjoy!